With more than 60 speakers on dozen of different subjects related to electric transportation, it is not going to be easy to choose which sessions to attend at EV/VÉ Conference from May 30 to June 1 in Markham, Ontario. But whatever are your specific interests, our 4 main panels will sure please you with prominent stakeholders from the EV world on essential topics for today and tomorrow. On Tuesday, May 30 at 1PM, Tomorrow’s e-Mobility session will bring together senior decision makers from the auto manufacturing industry, the insurance industry and municipal government to discuss their views of tomorrow’s mobility and how their respective organizations are preparing for this future. Catherine Kargas, EMC Chair, will moderate a panel composed of the COO of Kia Canada, the CEO of Aviva Canada, the Vice-President of Communauto. Later in the afternoon at 3PM, the University and R&D Roundtable is to feed the Canadian innovation strategy on how to make Canada a global leader in advanced clean transportation technology solutions. The panel will be initiated by presentations on recent outcomes, best practices, and lessons learned from NSERC-Automotive Partnership Canada funded projects, Pan-Canadian academic network CaRPE-FC and from InnovÉÉ Consortium in Quebec. The next day on May 31 at 9AM, get ready for the Government-Industry Summit with Ontario’s Minister of Transportation Steven Del Duca, the President & Managing Director of GM Canada, and the President of Nissan Canada. This panel will discuss how the government and the industry can establish successful long-term parternships. Finally, on June 1st at 11AM, the Smart Evolution of Public Infrastructure panel will conclude the series of conferences with practical questions on the transition to electric transportation, and the best business cases and key players involved to satisfy current and future EV drivers. This panel, moderated by Neetika Sathe from Alectra, will feature the Manager of the Sustainable and Innovative Transportation Office of the Ontario Ministry of Transportation, the CEO of AddÉnergie, the Director of Division Natural Resources Canada’s Transportation & Alternative Fuels, the Public Policy Director of ChargePoint, and the Director of BC Hydro’s EV Infrastructure Program. 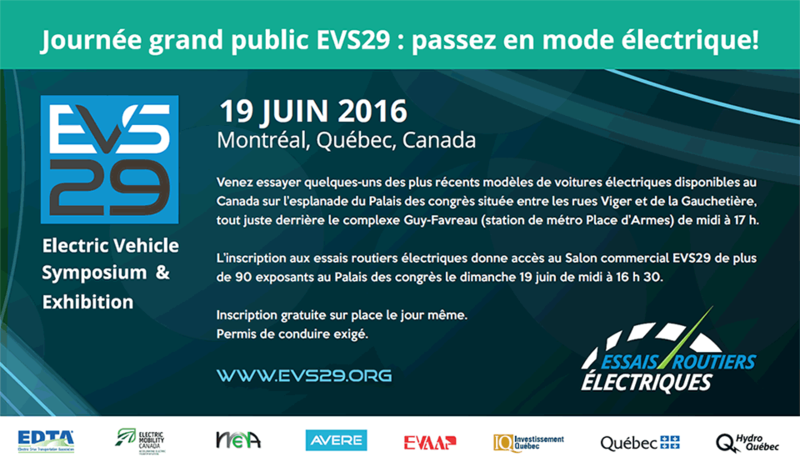 Find all the details about those essential panels in EV2017VÉ’s online program.